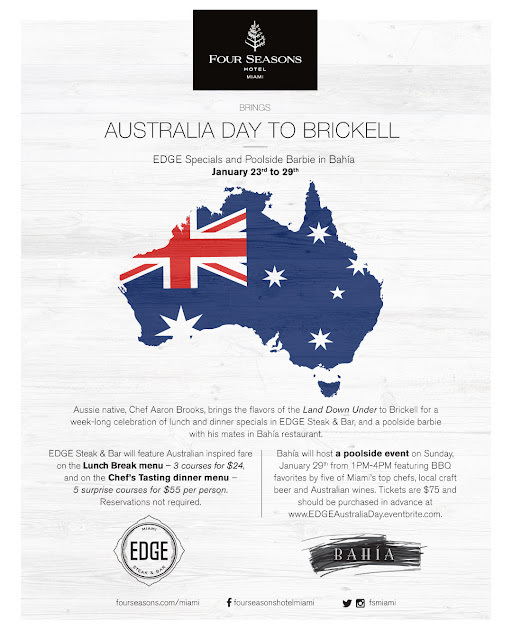 For the third consecutive year, Chef Aaron Brooks pays homage to the land down under, and its January 26th national holiday, with weeklong specials in EDGE Steak & Bar and a special ‘barbie with his 'mates on Sunday, January 29th from 1PM to 4PM at Bahía, the hotel’s 7th floor poolside restaurant and lounge. Diners can savor flavors from the land down under on the $24, three-course Lunch Break menu, offered Monday through Saturday. Available all week, the Chef’s Tasting Menu will feature five surprise Australian-inspired courses for $55 per person. The week of festivities will conclude with a ‘barbie in Bahía, the poolside restaurant and lounge, with Chef Aaron and his ‘mates on Sunday, January 29th from 1PM to 4PM. Turning up the heat, Timon Balloo of SUGARCANE raw bar grill, Jimmy Lebron of 27 Restaurant & Bar, Bret Pelaggi of Threefold Cafe, Steve Santana of Taquiza, and Nicole Votano join Chef Aaron for an afternoon of grilling. Attendees will enjoy BBQ favorites, Aussie bites and wine, a special Kangaroo Punch, and locally crafted beer from The Tank Brewing Co., and an exclusive, limited edition EDGE beer, brewed by J Wakefield Brewing and Chef Aaron, himself. Bring your budgie smugglers, a.k.a. swimsuits, and enjoy complimentary access to the two resort style pools, and celebrate winter in true Miami fashion – under the sun. Advance tickets are required and available at EDGEAustraliaDay.eventbrite.com for $75 per person, and include unlimited BBQ, Kangaroo Punch, select craft beer and wine, and complimentary pool access. *Pool chairs are based upon availability. Eventbrite processing fee will be applied at time of purchase. For more information, visit our website or email EDGEManagers.MIA@fourseasons.com, or call (305) 381-3190.